Unfortunately I could not make this event in Stromness. The evening featured the unveiling of the Scapa Flow timeline (described as a ‘collaborative project between Scapa 100, Stromness Museum, the National Maritime Museum, the University of Dundee and Huskyan Charters’) and a presentation on UB.116 by Simon Brown. 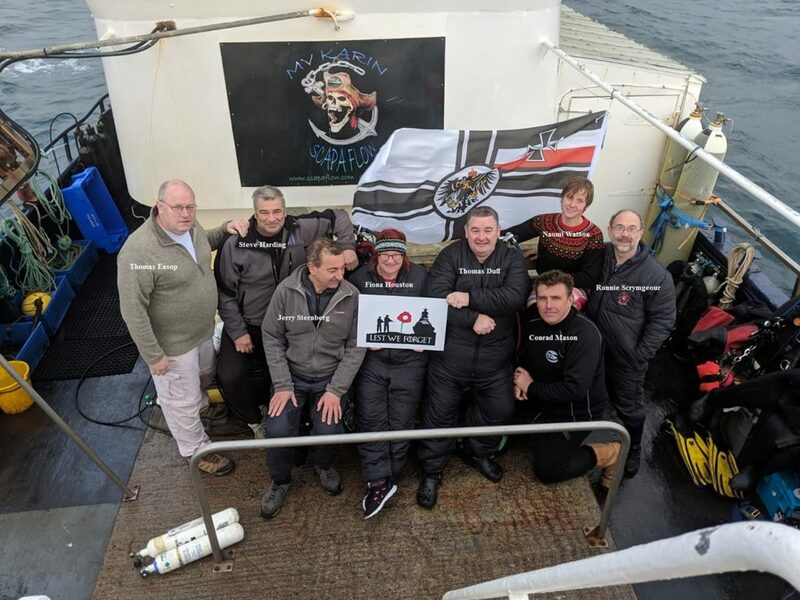 On 22 November, flags were placed ‘on each of the seven remaining wrecks as a mark of respect and commemoration’ by divers in Scapa Flow. 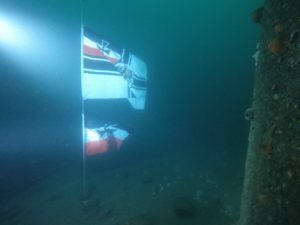 The flags have been left so that others diving the wrecks might be encouraged to have ‘a moment of reflection and remembrance’. Historic Scotland was consulted prior to the project and raised no objections. The flags are tied on with 3mm cord to prevent damage to the wrecks should a set be snagged. Periodic maintenance dives throughout 2019 will be held to inspect and replace the rigging if required. 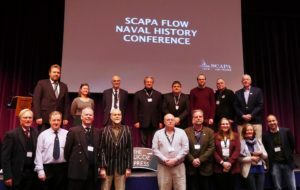 A two-day event was held at Kirkwall Grammar School on November 23-24, 2018 (November 23 was the centenary of the first German ships arriving in the Flow). 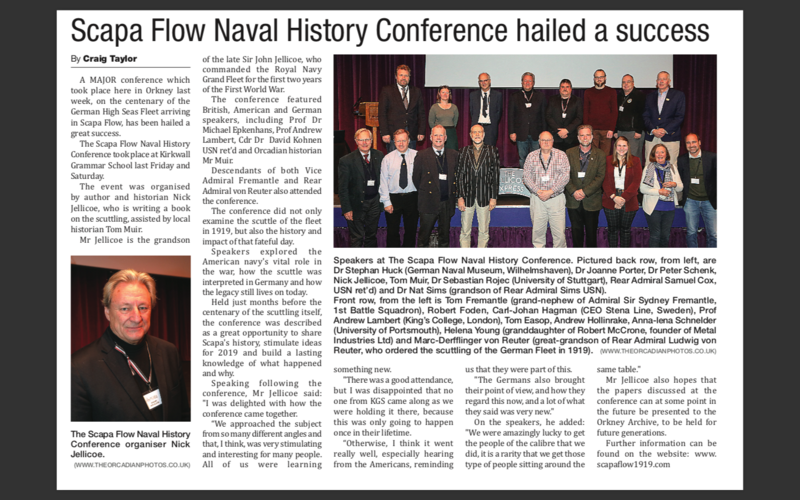 A number of distinguished speakers attended and presented papers on many aspects of the Flow from its history to its ecology. It is hoped that papers and presentations from this conference will shortly be available through David Mackie at the Orkney Archives and Library, Kirkwall. Nick Jellicoe (L) with Nat Sims, Tom Fremantle and Marc-Derfflinger von Reuter at the Nov 2018 Naval History Conference, KGS. 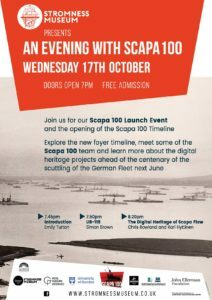 An event agenda is not yet known but events might include the re-dedication ceremony at the Lyness Commonwealth Graves Commission cemetery and the ringing of the salvaged bell from SMS von der Tann. Descendants will be a central part of the commemorations (both the descendants from the Flying Kestrel school outing as well as the Fremantle, Reuter and Madden families). 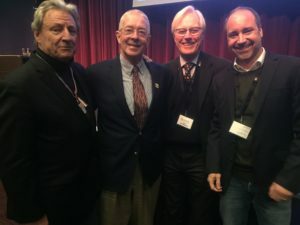 A conference is planned for October 2019. Details will be posted when known.